For the fourth time this week I have been asked what I paint. Normally I’m dismissive and give some vague answer–what I feel-think-hear-especially music and I get the nominal blank look but now I have got really into formulating a reply. I paint what I think about color and sound. It is known as Synaesthesia. 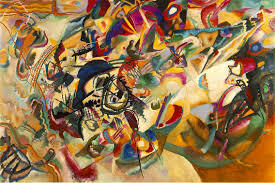 “In 1925 Georg Anschutz, then Professor of Psychology at Hamburg university had brought together a team of investigators devoted to ‘psychological-aesthetic research’, whose main aim was to scrutinize the interconnections between light and sound, color and music, movement and rhythm, regarded from both a physical and psychological stand point.” : The Music Of Painting, Peter Vergo, (see website – favourite books and links). It is not an emotional reaction in any way. It is color and texture using paint and other mediums to replicate sounds particularly those of music. I orchestrate the textures/tones of different instruments. It took me a while to figure it out for myself when I could not understand why I disliked some music intensely and wanted continuous repetition of other music works. It probably started when I was very young–and I do not by any measure think I’m unique in this. It could be church music-my grandfather singing-my father playing the harmonica or the piano–birds–many things. The first classical music that I played over (30-40 times) was Tchaikowsky’s Violin Concerto and the other was Rossini’s Overture to The Thieving Magpie. I believe I have done many versions to both works but I also incorporate other sounds and–this is the key–I don’t know what they are. There are acres of information in my subconscious and I draw on that at will. There it is-not complicated-and I have had a lot of company. Many artists work from this aspect of creativity. Came across a lovely book of poetry and paintings the other day. The poetry in this case a direct response to each painting. I wrote a poem “Hollow Men” as a reaction to one of my own sculptures (on my website). The Sacred Series was as a result of much study and research of the bible–several bibles in fact as I contrasted the translations. It would be quite something to have the know-how to translate from the original and see if the interpretations would be that different. I just found a book in Polish which intrigued me. (I could read Polish as a child) I recognized one in about 30 words but the subject seems to be about music–so I will get a Polish dictionary and see what comes up and where it goes. I could really go on about this but I’m sure you get the idea. The Portrait works seem to be a diversion but I don’t think so. For instance, the sheer ugliness of my daughter-in-law is not difficult to portray. Anorexic people not only try to destroy themselves but also those around then. It is,in my opinion, a nihilistic process which in actual fact is a way of ‘life’. In my experience, the texture of the sounds of my daughter-in-law Simona’s voice give rise to much visuality for me. I hear death in her voice. What is the color of death? I see her endeavouring to destroy her child-not necessarily consciously–but are not anorexic people aware of there own self destruction? I believe so. There is destruction and annhilation of the spirit-the soul.This has color, texture,tone…..hue, intensity and value (hiv).This I will paint as I wish to expand the theme beginning with portraiture.